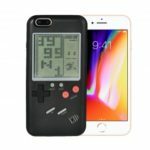 Protect your iPhone X with this hard back case. Made from toughened PC material, it will protect your phone from bumps and scratches and keep it in pristine condition. 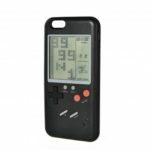 Comes with creative game console design, it is an interesting phone case that can play games. Have fun just like a child whether in the traveling, waiting for a bus, party gathering, etc. Bring you lots of fun. 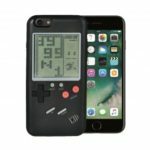 Creative 2-in-1 design, not only a phone case, but also a game console with built-in classic games. 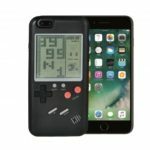 It is your perfect retro portable game partner, interesting and amazing. Retro game time, bring you back to childhood joy. Enjoy funny time whether in the traveling, waiting for a bus, party gathering, etc. Adopting toughened PC material, it will protect your phone from bumps and scratches, well protected your phone. Specially designed for iPhone X, it has precise cutouts for charging ports, audio ports and buttons, fits well to your device and make it easy to access to all controls. Premium material, sensitive keys, comfortable feel, easy to operate, it is an ideal gift for yourself, family, friends, customers and so on.